When I published my index to Queensland's old age pension records, I donated a copy to the Public Search Room at Queensland State Archives. I recently discovered that it was no longer there. I also found out why - and I was not happy! The Archives said that they took it away to create an electronic version (which will undoubtedly end up on the Archives Web site). I was told that my indexes 'cause trouble' because people see the names on Findmypast, but don't quote the source reference shown there when they order document copies from the Archives. I don't know how many such orders they get, but it is apparently too much trouble for staff to consult my printed index. I pointed out that I donated my index for the benefit of family historians who visit the Public Search Room. The archivist agreed to put it back there, but (get this!) she said that they may have already removed the binding and started scanning the pages of my index, in which case it will take a while to get them bound into book form again. I should mention that I'd previously been asked whether I would give the Archives an electronic copy, and I said NO (along the lines of, 'If you want to waste time reinventing the wheel create an index, knock yourselves out, but don't take advantage of all my hard work'). Genealogy is my business, and I've spent thousands of hours indexing original records! My indexes to hospital records have also disappeared from the Public Search Room. The Archives may try to tell you that they removed them because the records are no longer open to the public. 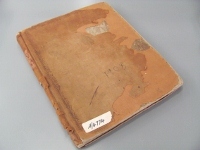 The Croydon Hospital index 1888-1919 includes some pages that are currently less than one hundred years old, but most are accessible now, as are all of the Brisbane Hospital and pension records that I indexed. For more information about the records, 55,000 names from my indexes, and details of my research and copying services, follow links on 'indexes to historical records and other sources for genealogy'. That's shocking! And then they expect others to do the right thing. Staff changes? Go to the top. Pauleen, I've been stewing about this since Thursday, and I re-wrote the blog post umpteen times because I wanted to present a balanced view of the situation. Unfortunately, in the current political climate at the Archives, I don't believe that 'going to the top' will make any difference. But you can be sure of one thing... I will never again give the Archives access to any of my indexes! Entirely reasonable to refuse them, I'd have said. Pauleen, as you'll have seen in my later comments, I opted to leave the Old Age Pensions index and Brisbane Hospital index in the Public Search Room (to encourage family historians to use the original records). However I will check regularly to make sure that they are still there and have not been removed by staff who deal with copying requests. Thanks Greg. I gave the index to the Archives, thus making it 'available', so I can't see any justification for scanning it for other purposes. Correct me if I'm wrong! Thanks for your comment, Shirley. If raising this issue ultimately helps people like yourself who are working with archival collections, it will all have been worthwhile. This is the second instance in the last week (one in the U.K. & now this) that I have heard material gifted to an archive has been altered. This is why any material I give to a records office or archive is on loan. That's interesting, Julie. I wish I'd thought of the 'loan' idea way back in the beginning (many years ago). Hindsight Judy! Is a wonderful thing! In the Netherlands, an index probably would not be protected by copyright, since two people could independently create the same index so it's not creative enough. The hard work that goes into creating an index might be protected by database law, not copyright law. But apart from the legal aspect, there's also the ethical aspect. If a researcher does not want their index to be turned into electronic format, the recipient of that index has to respect that. Thanks, Yvette. It's always interesting to hear how things work in other countries. I totally agree with what you said about the 'ethical aspect'. Jacqui, it's such a shame that the situation makes us feel that way. Sometimes it just takes the actions of one person to ruin it for everyone. Yvette's comment about 'database law' prompted me to download this information leaflet from the Australian Copyright Council website: http://www.copyright.org.au/acc_prod/ACC/Information_Sheets/Databases__Compilations__Tables___Forms.aspx. Judy, sorry to hear that. I'm always in awe of all the indexing you have done over such a long time. You have every right to be upset. I do hope that they haven't pulled your printed copy apart. Your request should have been respected. Thanks for your encouragement, Chris. I really appreciate it. And I'm glad that I saw you at the Genealogy Roadshow - it had been ages since we last bumped into each other. We were sorry to read your account above and would like to clarify a few things as there appears to have been some miscommunication. Firstly, let me reassure you that your index to Queensland’s Old Age Pension Records has not been digitised and has not been pulled apart. The Archivist on duty was explaining the procedure of what would happen if the hard copy index was to be converted into an excel file. If the hard copy index had been converted to an excel file, we would have used 10% or less of the data in the index as required by the Copyright Act 1968. As you are aware, our volunteers are currently working on a pensions index directly from the original records in our collection to complement our existing pensions indexes which are available online for all Queenslanders to access. Your index to Old Age Pension Records had only been removed from the Public Search Room for evaluation and is back there now. We will not be using this index to add to our own indexing work. Your hospital records indexes have definitely been removed from the Public Search Room as they each contain some records that come under a 100 year closure period and we cannot be in breach of that (this covers anything after 1917). Yes there are some open records in these indexes but we are unable to provide selective access with hardcopies. We greatly appreciate the time and effort that goes into researching and putting together indexes as our own volunteers are busily doing the same for us day in, day out. It is our ambitious goal to put as many Queenslanders as possible in touch with their state collection and, by putting indexes online, we provide access for those living in remote and rural Queensland, as well as those overseas or simply unable to make it to Runcorn. We look forward to seeing you back in the search room soon, Judy. Jenny, you said, 'If the hard copy index had been converted to an excel file, we would have used 10% or less of the data in the index... But what possible use could there be for such a file (10% of the total)? None that I can think of - so why were you even considering doing that?! You also said, 'Your hospital records indexes have definitely been removed from the Public Search Room as they each contain some records that come under a 100 year closure period. That is not true. If you look at my Brisbane Hospital index, you will see that it is for four sources with dates in 1887, 1900, 1901 and 1902. They are all open to the public. I am glad to know that my index to Old Age Pension Records is now back in the Public Search Room, and that you will not be using it to add to your own indexing work. As you are not able to put my hospital indexes in the Search Room, I would like them to be returned to me, please. I will collect them from Reception on my next trip to the Archives. Thanks. The Brisbane Hospital index was not in the Search Room last Thursday. I searched everywhere (all shelves and tables, and in the microfilm room). I would like it to remain in the Search Room, because I want to encourage family historians to use these excellent records. I will just collect the Croydon Hospital indexes, thanks. Jenny, I checked that nobody in the Public Search Room had it at that time. Perhaps your staff were using it. They've often told me that they get copying requests from people who find the names on Findmypast.